This episode was based on the short story 'The Adventure of the Western Star', first published in The Sketch in 1923. The story was adapted for television by Clive Exton and directed by Richard Spence. The adaptation remains largely faithful to the source material, with some notable exceptions. Exton chooses to make Poirot a big fan of Mary Marvelle (Marie Marvelle here), who is now a Belgian film star. This change is actually quite amusing, even if I find it difficult to believe that Poirot would be 'starstruck'. 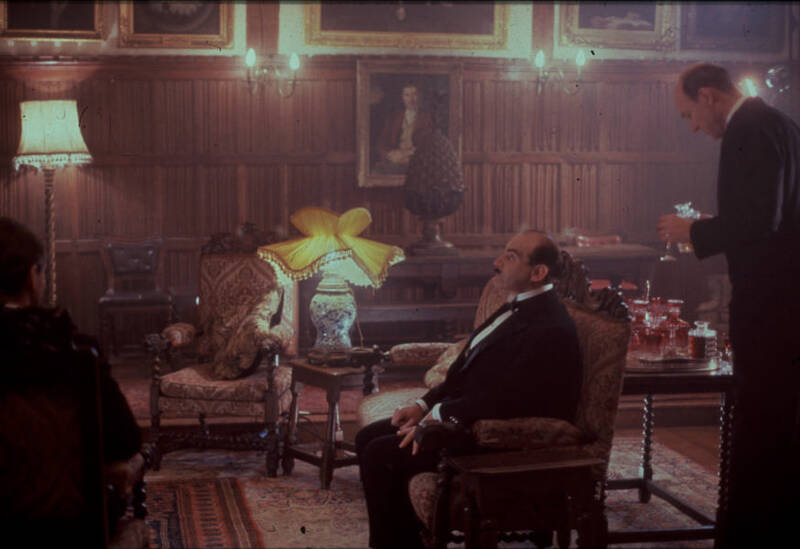 The interview is moved from Poirot's flat to her hotel, but Lady Yardly's visit is kept almost intact (with Hastings as the interviewer). Also, Exton adds a subplot involving Japp and Scotland Yard, who are trying to catch a diamond collector, Henrik Van Braks, red-handed. Van Braks becomes a potential buyer for Rolf's diamond, with Hoffberg (mentioned in the short story) as an intermediate. Lady Yarldy's confession (hinted at in the short story) is here expanded into a full scene at Whitehaven Mansions. Moreover, Miss Lemon is added, but she gets little to do, apart from showing visitors in and out. In addition, there's a rather nice scene at Poirot's barber. Finally, there's the ever-present chase scene (this time at 'Corydon Airport'), and a dinner between Poirot and Hastings in the final scene. All in all, though, Exton's changes make complete sense and the adaptation works quite well (even with Christie's over-the-top Chinaman stuff). Spence does a decent job of utilising the locations. The most important locations include Dorney Court, Windsor in Berkshire ('Yardly Chase'), Shoreham Airport ('Croydon Airport', also seen in Death in the Clouds and Lord Edgware Dies) and Widegate St., London E1. See location photos here. The soundtrack works quite well, particularly what seems to be Marie Marvelle's theme (the score is composed by Richard Hewson in Gunning's absence). The aforementioned scene at Poirot's barber brilliantly conveys his sense of symmetry, insisting that the one sideburn was three millimetre shorter than the other. Also, his love of all things Belgian (which we will see in later episodes as anything from Belgian food to miniatures (The Underdog)). The guest actors are all quite memorable, with the Belgian couple, Gregorie Rolf and Marie Marvelle (played by Rosalind Bennett and Oliver Cotton) as particular standouts. On a side note, I think this is the only episode of the entire series in which Poirot has a conversation in French (apart from a witness in Death in the Clouds). Rosalind Bennett's accent is straight out of 'Allo 'Allo, and her melodramatic acting isn't much better. Until she actually has to speak French near the end, when suddenly she becomes much more convincing. Is this the only TV episode where Poirot refers to himself as Papa Poirot? Oh, he does it in Blue Train too.